Even though Erika spent three semesters at two different schools before enrolling at Purdue, she will graduate in four-years. Erika credits much of her success to her Liberal Arts Academic Advisor. She says, "My advisor has helped me succeed throughout my time at Purdue. She’s always encouraged me to work hard, and has helped me decide which classes to take every semester." 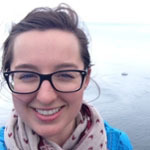 Erika shares tips for other liberal arts transfer students, "Don’t be afraid to take every opportunity you can to be learn new things. Especially take advantage of faculty office hours and talk with your professors and teaching assistants." Erika was initially interested in Purdue because of its affordability. She also knew the University had numerous study abroad options that varied in length and cost. Once she was learned more about Purdue's College of Liberal Arts and the Brian Lamb School of Communications she was convinced. Her interest in British culture and history lead her to spend a semester in Canterbury, England, UK. 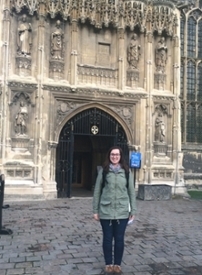 Erika participated in Purdue's exchange program with the University of Kent. She stated, "Getting to know a new place and way of life was very exciting and rewarding. Canterbury has so much history and culture as well as a very diverse group of people. Living and traveling in a place where I knew no one taught me many important life lessons, and gave me more confidence and independence." Erika was also able to travel on the weekends and during breaks. "Exploring places I’ve been dreaming about my whole life such as London, the Cliffs of Moher, and Italy was absolutely surreal. I met wonderful people and made great friends.” stated Erika. After graduating from Purdue, Erika hopes to secure a public relations position in a nonprofit organization. What’s Erika's dream job? There’s no doubt we’ll be sure to catch her working at NPR or on The Today Show.